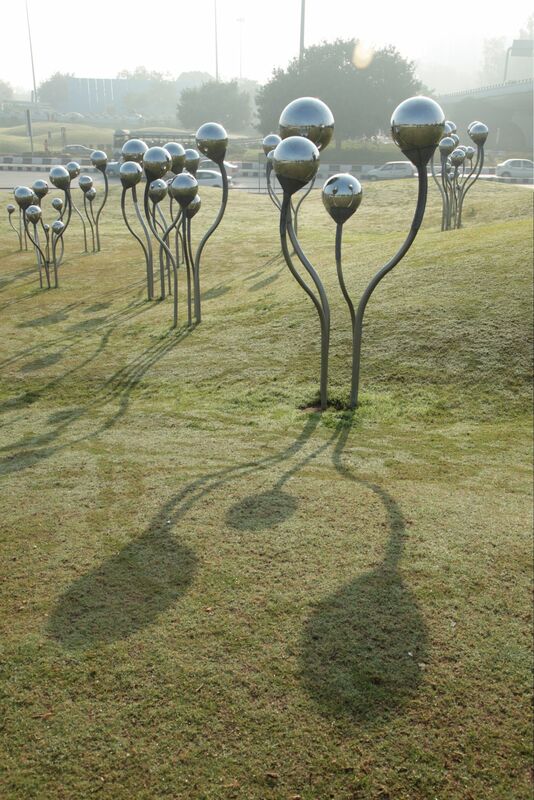 Installation Art - Sprouts at Delhi, by Vibhor Sogani - ArchitectureLive! 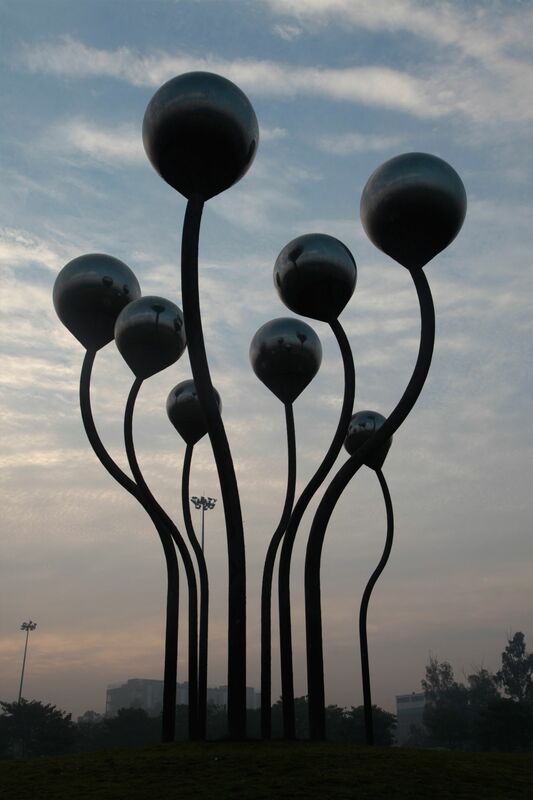 India’s largest site-specific public art installation – ‘Sprouts’, standing 40 feet tall, came about as a Delhi government initiative towards the beautification of the capital. It is spread over 6 acres of greens surrounding the AIIMS flyover in the heart of Delhi. ‘From walled city to world city’ was the one line brief given to Vibhor Sogani by Sheila Dixit, the Chief Minister of Delhi, more than 10 years ago. Following the brief, the Sprouts project was initiated with the idea ‘when the seeds begin to sprout’. 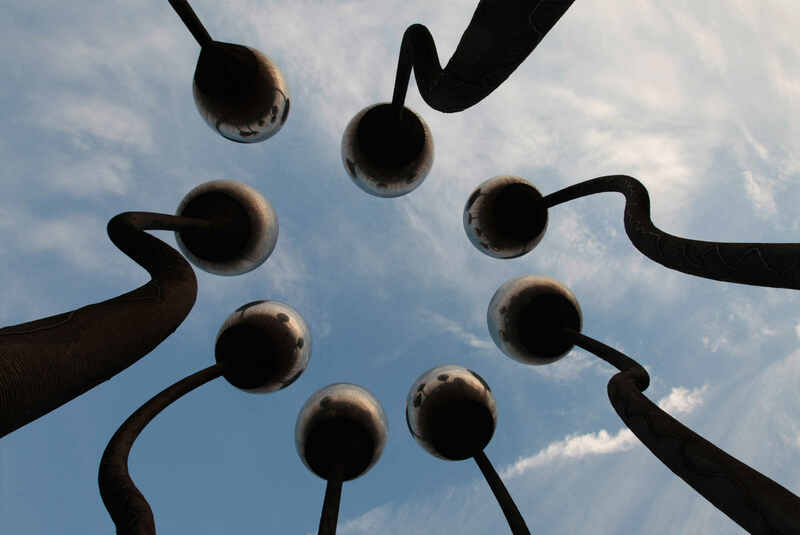 The objective was to create a landmark through a series of installations signifying growth, development and progress. 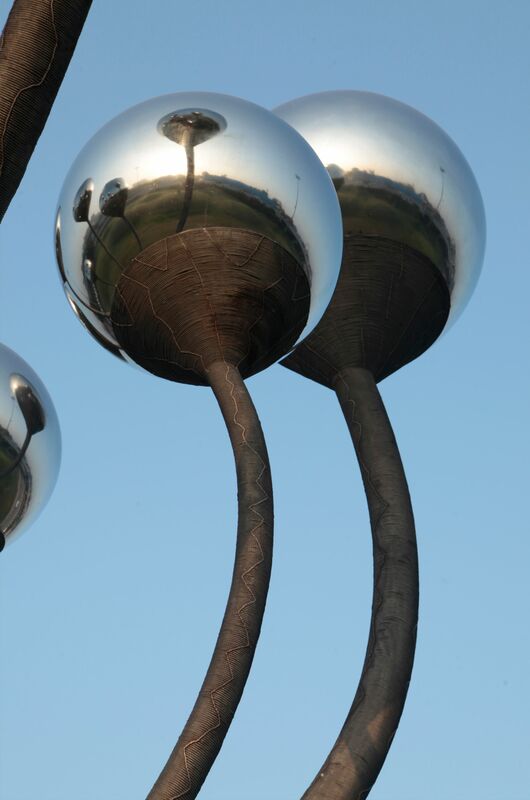 In harmony with the landscape, the idea behind the installation was to depict India as a growing nation through Stainless steel – the new age material. Designed to showcase India as a ‘world city’ for the upcoming Commonwealth Games in 2008, ‘Sprouts’ is symbolic of the feeling that India is rising after 60 years of independence. Vibhor Sogani, born in Rajasthan, India, specialised in Industrial Design from the prestigious National Institute of Design, Ahmedabad. Given his diverse interests, he engaged in a wide range of creative projects in the areas of exhibition, graphic, retail and product design, for top global brands. Over the years, Vibhor has exhibited his works in various design & art shows. He has also handled offbeat projects like developing the country’s first few go-karting tracks; redesigning Mumbai’s suburban trains, redevelopment of copper craft in Kashmir, designing & producing some of the prominent trophies for international sports matches and government events, to name a few. 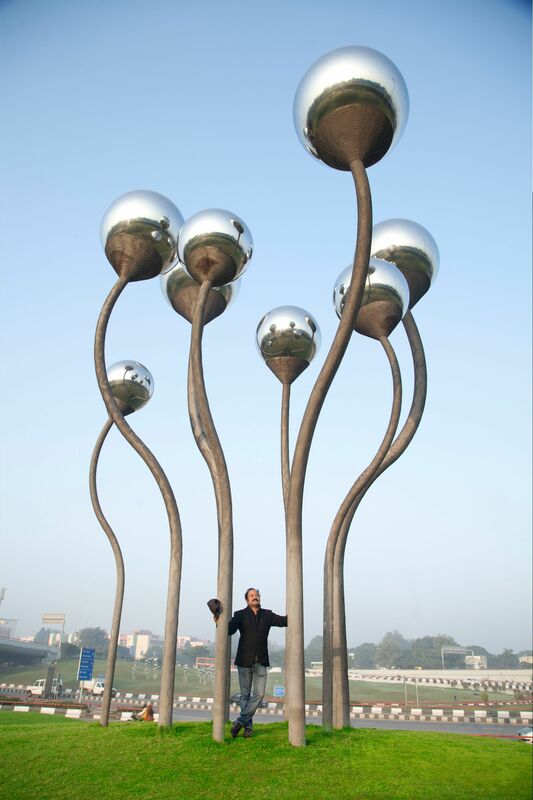 Famous for India’s largest and most visible public art installations, the ‘Sprouts’ (a Delhi Government initiative towards the beautification of Delhi), a 40 ft high stainless steel installation spread over 6 acres of greens surrounding the AIIMS flyover in the heart of Delhi, Vibhor Sogani’s creations are recognised globally. He has recently executed a 35 ft high installation, ‘Kalpavriksha – the wish fulfilling tree’ in Ahmedabad, which is perhaps the largest public art installation of the state and the second largest for India. In October 2016, his solo exhibition titled ‘Mahatma in Me’, a tribute to Mahatma Gandhi, travelled to Australia to mark the occasion of Gandhi Jayanti. It was supported by the Australian & Indian Government, and was a huge success within the art domain. In August 2017, the exhibition was invited to Zimbabwe to mark the celebration of 70 years of India’s independence and beginning of the Indian festival ‘India in the Sunshine City’. In December 2017, the exhibition travelled to Tanzania and the works were displayed in the National Museum. The exhibition was supported by the Government of India and ICCR. The exhibition features 12 artworks in stainless steel representing Mahatma’s values of peace, equality and nonviolence. In 2002, he launched his signature brand called SOGANI by Vibhor Sogani of lifestyle accessories using steel in combination with wood, brass, glass, etc. The SOGANI studio, with its R&D center and flagship show space is spread across 35,000 sq. ft. in New Delhi with an eclectic repository of over 60 indigenous designs. In 2018, SOGANI became the first Indian Lighting Designer brand to make it’s presence felt at the Light + Building fair in Frankfurt this year with its bespoke creations. Multiple EDIDA winner, Vibhor has also been awarded ‘Indian Art Icon of the Year 2014’ in Singapore and has been recently nominated by the Government as a member of Governing Council of the India Design Council.